In lieu of our anniversary today, I wanted to post a song that I just love lately!! There have been songs that have reminded me of Danny and my relationship but this song just hit home when Danny had me listen to the lyrics. It's so us! It talks about dancing together, bringing her home to meet his parents and sleeping on the couch, which I did one Christmas. (And can I just say kudos to this song for implying that they did NOT slept together before they got married!) They buy "a piece of land and some apple trees"! And in the video, they are fixing up their white sided house! Their baby has the mama's eyes, which Danny thinks Caleb does. The only difference is our kid is a boy not a girl. Can you believe Danny's the one that discovered this song?! I actually thought it was that stupid "hey girl" song and was about to change it. Danny stopped me and said, "I thought you would have liked this song". When I asked why, he said, "because it reminds me of you". So, of course, that's when I changed it back and had to listen to it. I, then, discovered it was not at all the stupid, "hey girl" song and that I absolutely loved this song too!!! Our laundry room wasn't in bad shape, but we were wanting to close it off so we wouldn't have to hear a spaceship take off each time we needed to do laundry. We also figured this would be a good time to put in a new, working back door, the current one -which was the original- was nailed shut. And I figured this would also be a great opportunity to redecorate the laundry room. Make some use out of the ideas I've pinned! So we got to work, Danny installed both doors and added a shelf next to the cabinets. I installed the back door knobs and my dad put in the glass knobs on the other door. Then I made the room look cute! I'm not gonna lie, I got this idea from Pinterest. And Yes, I do know that the washing board goes up and down, however, I thought it looked better across. :) So that's how I put it! We hung the cabinet a few years ago, but just added the shelves to have more space. My homemade laundry soap! We're loving it! -Don't try the liquid kind. Same ingredients, it would just separate and didn't clean our clothes as well as this kind does. 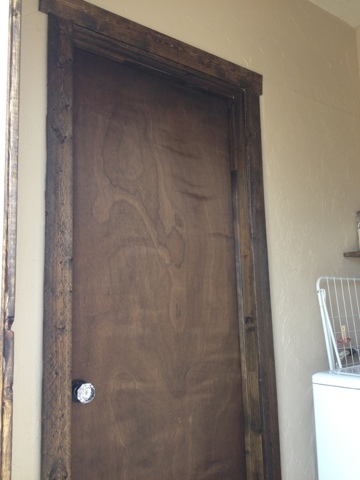 Here's somewhat of a view of our new back door. Look how bright it makes this room!! Love that window! I think this room turned out great! I smile every time I go in this room. Which is a good thing because I've done more laundry since I've had Caleb that I ever have my whole life... or so it seems! And here are some of Caleb's cloth diapers freshly washed! While we've still had plenty of projects going on around here, there wasn't as much time to write about it. Therefore I thought it would only be appropriate to start back blogging with a blog about Caleb. :) Well, at least I like the idea of that. I'm a very PROUD mama! And his room was after all the most important project that we wanted to get done! We now only have one of those windows. Yep, before we got new siding on the house, Danny dry walled one of the windows up. It was too much and left us will no wall space. And now how it looks with sweet baby boy in it! Aw, my sweet boy! He loves to sleep! P.S. I was worried about how the greasiness of the food would effect my stomach, but I had small portions and the baby liked it just fine! I've also noticed that since I get to sleep later(cough 7:30) on Saturdays, nausea doesn't hit me as strong on those days. Ok, I know this is a little cheesy, but I came up with this the other day driving down 30 because I use to always get asked jokingly if I had "blueberry" in my stomach yet. There's a berry in my belly. What kind can it be? A blueberry? A strawberry? A raspberry maybe? No, no, no that just cannot be. Is growing can't you see. All the details confirm it's a little Mayberry! Soon to be our's around April 19th!! 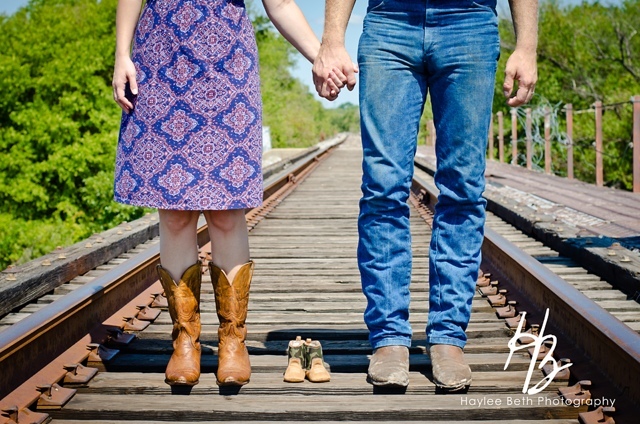 Our family is growing by two feet... Coming soon this April! 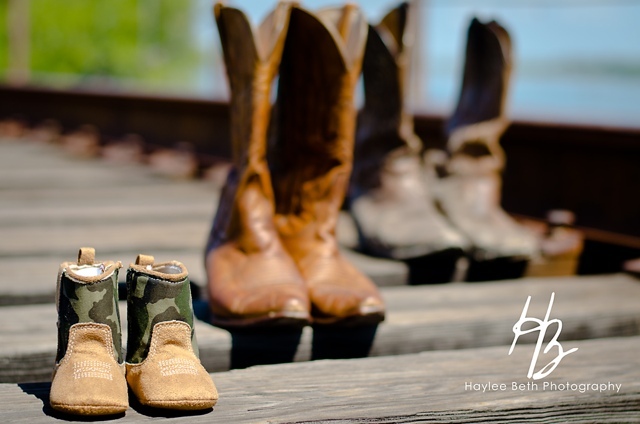 Guess who the boots in the middle are going to belong to?! Yep, a future little Mayberry! The night before we found out we were having a baby, we were at our small group and I was talking with one of my friends who just got pregnant. I was telling her how I was, of course happy for her, but jealous that she was pregnant and that I would never get pregnant, lol. The next morning I decided to see if I was pregnant just for kicks and giggles, not expecting anything. And lo and behold, after months of hoping and praying we (well I) got pregnant! I was so excited that I rushed, got ready, and drove out to Danny's work to see tell him. There's no way I could wait 'til 4:00 when he got home to tell him and I didn't want to tell him over the phone. However, he didn't have his phone with him that day so I couldn't find where he was went I got there. I called his partner he worked with, his boss and I couldn't get a hold of anyone! I was so worried I wouldn't be able tell him, until I finally ran into his other boss who told me Danny should be back in 10 minutes. I was eventually able to talk to Danny and tell him the awesome news. I got the biggest, sweatiest hug ever... I've never seen him so excited. It was a great moment! Later that night we went around to each of our parents', grandparents', and siblings' houses to share our exciting news! -It brought tears to my eyes (and my grandma's) to get to tell my grandma that at 88 (soon 89) she would finally get to be a great-grandma!- And conveniently, our last stop was my in-laws where we stayed and watched the Cowboys game. It was by far the best day of the summer! Just went I was starting to lose faith, God heard our prayer and answered it in HIS timing. Down the hall, in my grandma's house is a wall of family pictures. And from the time I was a little girl I always loved looking at those pictures. I always thought it was so neat that my grandma had all of those pictures. Someday I wanted to have my own wall of family pictures. That someday finally happened this summer! *Please don't look at all the mess. This was when we still had no couches and everything was in the living room, including our bed.... but that's a blog of it's own! Over time I started making copies of family pictures and finding various (cheap) wooden frames for all the pictures. Then I worked on arranging them so they all fit just right. Danny had the great idea of incorporating our Mayberry picture sign in. So using with that idea, I placed pictures of us with both our families in the middle. Then on the left, I have pictures from Danny's side of the family. And my side of the family is on the right. After the pictures were arranged just like I liked them, Danny helped me square off the section of the wall so everything would be level and even! We did it with yarn...he's so smart!! My way would have been 10 times more complicated to level. I've still got some work to do on it. As you can see I still need to put in some more pictures from my family. And I want to put a light in the hallway so you can see the pictures better. But overall, I love it! It's one of my favorite things in the house... well among many others ha! Before we got engaged, my hubby bought this old 1950's beat up house with the dream that together we could turn it into a beautiful HOME on a nice piece of land. So with that dream followed a ring, and a wedding followed even faster behind. (We had to get the show on the road) And on began the BIGGEST project either our crafty souls had ever worked on. See when we say the words renovating we mean it literally. Not repainting a few walls, not redecorating (although I'll be doing some of that), not HIRING someone else; oh no, not us. We are fixing this house inside out, from top to bottom. Ha, some have said it would have been easier to tear this house down and start from scratch, but live and learn!